mix for dinner and gone through the continuous cycle of yogurts and protein bars. I certainly have my favorite frozen items on hand. But, as a trained chef, I have come to the realization that our meals, even those that are solo, can be savored and celebrated with a diversity of flavors and variety after a bit of knowledge, planning and our own individual finesse. Thus has evolved the creation of “The Deliberate Pickle.” Our deliberate actions are, of course, the ones we do with the intent and purpose to move forward. In the culinary world, a pickle is a cucumber or other vegetable preserved in brine to be consumed later. In contemporary slang, a pickle can refer to a troublesome situation. The troublesome pickles we find in our daily food needs will turn into pickled morsels that are preserved for purposeful future use. In creative and professional endeavors, the goal of going solo is often the ultimate achievement: the musician who has practiced for hours to play the coveted solo or the aviator who is training for their pilot’s license and achieves the approved acumen to take their first solo flight. Yet, many of us are winging it when it comes to the solo necessities of day-to-day life. Somedays we are coping, somedays we feel we are just surviving, somedays we are struggling. We can often make small steps towards shining. When living solo, the positive moves forward are solely personal. The comfort with one’s self and one’s surroundings become more and more intentional. The achievement of that first solo flight only came after instruction from an experienced pilot. I have the food and cooking knowledge to make this deliberate move forward. So, I truly hope I can help move us out of our ruts. My goals for this blog are partly selfish. I need to eat better. I need to be kinder to myself. I also truly enjoy teaching. The cooking classes I have led have been quite rewarding. The focus here will be on ingredients, techniques and tools. The echo I am hearing from people who are perfecting their meal process of eating solo, recipes are often not useful. The portions are too large. Food and cooking have long been at the center of my life, though our relationship has evolved. I am the oldest of eight kids so spent a lot of time in the kitchen with Mom. My Dad always had a huge vegetable garden and we frequently shopped at farmers’ markets. Each fall, bushels of fruits and vegetables were canned for winter meals. I was a kid in the 1960’s and a teenager in the 1970’s in Milwaukee, WI, a blue collar big city in an agricultural state. Mom, who is now 84, likes to remind us that she cooked for ten people before microwaves and most frozen foods! I have worked in the culinary industry for the past twenty years after I changed careers and became a Chef’s Apprentice. I feel so fortunate to have learned the vital techniques in a French restaurant from a very talented chef. I worked for Chef Mark Weber at Bartolotta’s Lake Park Bistro in Milwaukee for seven years (www.lakeparkbistro.com). I now live in Madison, WI, about 90 miles west of Milwaukee, where I went to college years ago. It is home to one of the most renowned farmers’ markets in the country which encompasses the Madison Capitol Square every Saturday morning from April-October (www.dcfm.org). Local food and supporting family farms are a major priority here. As I have developed the concept of “The Deliberate Pickle,” I was thrilled to come across Eric Klinenberg’s book, “Going Solo: The Extraordinary Rise and Surprising Appeal of Living Alone.” (The Penguin Press, 2012, www.ericklinenberg.com). He and his team found that even though there are many different routes to this choice, increasingly people are opting to go it alone. The researchers were surprised to find that going solo was far and away most often a positive, purposeful step for personal freedom and private, restorative space. ny solo diners eat on the run during their work day or don’t share the same daily schedule as those they share a household with. The Deliberate Pickle is part of the purposeful steps forward. Variety and healthfulness can be achieved bite by bite with confidence gained on each plate. Thanks for sharing the table. Please pass the salt. Maybe the newness of spring struck me even more pleasantly this week because our winter was extra-long and I have been working extra hard. I have long thought the official New Year should begin right here with the blossoms and the breezes and the opportunities to till and explore what we find. I am glad to be back on the blog turning up ideas and observations for your blossoming food skills. I have been writing, but not on this blog, for the past several months. I completed a book proposal which I then pitched to literary agents at The Writers’ Institute, the largest writers’ conference in the Midwest. I am fortunate to have attended it for the past three years since it is here in Madison, WI and sponsored by the University Of Wisconsin Department Of Continuing Education, which is where I have become reacquainted with my love for writing. When my writing instructor urged me, in mid-January, to get a book proposal together, based on the topics of this blog, by the deadline of the Writers’ Conference, I nervously said it was only 90 days away. But I researched each necessary segment and wrote and re-wrote for ten weeks. A book proposal, for a non-fiction book, not only includes sample writing and a book outline but research about the potential audience and what books are out there in the same subject area and why your proposal fills a gap. I am still waiting to hear back from some of the agents. I got one response that was essentially “I like your idea, keep working on it,” which I see as words of encouragement and not the dreaded rejection letter. She rightly pointed out that an author gets one chance with each publisher and each chance should be the best effort possible. Agents are the representatives of the authors in the publishing world. Their job is to know the intricacies of the publishers and seek out opportunities for authors. I’m willing to keep writing and editing. It’s just like when I was learning how to cook. It’s a process with error and feedback along the way. Here is the upside of the internet. Your comments and feedback are why I am moving forward. 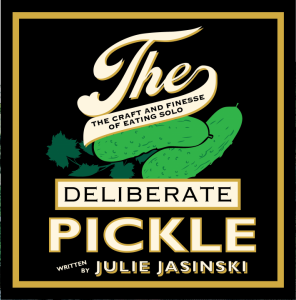 My goal when I began to write The Deliberate Pickle remains the same: to create an approachable framework for the craft and finesse of eating solo. The way America eats is changing rapidly led by the stunning fact that half of all meals are eaten solo, not just by people who live solo. Many lives are segmented and scheduled and split form those they may share a house with. Also, noteworthy, is the vast amount of food choices we now have from wider choices in groceries to a vast variety of prepared food from restaurants and delis in food stores. I am encouraged and confident that The Deliberate Pickle, in its future book form, can be a useful resource for future readers. Thanks for your current and future help in the process of tilling to see what we uncover. I will periodically keep you updated on this process. I’m still trying to sort out the loss of my favorite coffee shop bakery, only half a block away, that was lost to fire. It’s where I went to write. And they made amazing chocolates!